Northern Provincial Council (NPC) member M.K. Shivajingam on Tuesday vowed to confront any legal action from the South against the joint appeal sent by the majority NPC and Eastern Provincial Tamil National Alliance (TNA) Councillors to the Office of the UN High Commissioner of Human Rights (OHCHR) in August demanding investigations on genocide against Eezham Tamils. 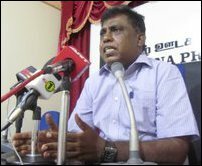 At a press conference held at Jaffna Press Club, the senior political leader of Tamil Eelam Liberation Organisation (TELO) also warned those expressing views against the association with former militant groups turned political parties constituting the TNA alliance not to spoil the unity within the Tamil alliance. Mr Shivajilingam reminded NPC Chief Minister C.V. Wigneswaran on the past history and legacy of corporation that existed between the ex militant and political parties that represented the Eezham Tamils. He touched on how the TULF came forward to nominate the imprisoned TELO leader Kuddimani as the TULF parliamentary candidate in the early 80’s, how the militant and traditional parties worked together in representing the Tamil position at Thimphu in 1985 and how the abandoned ITAK house symbol was mooted as the symbol of the TNA by the LTTE leader. He also reminded the current deviators among the TNA on how the TNA was formed with the initiative from the Tamil journalists from the East, especially how the statesmanship and political thought of the renowned Tamil journalist Sivaram Dharmeratnam had contributed to the creation of the TNA. “TNA is not only an electoral alliance. The people want to see it as a unified body and embodiment of their political aspirations,” Mr Shivajilingam said. “The people don’t want to see us launching branches of TELO, EPRLF, PLOTE and ITAK in the districts. They want to see us working as a sole body of the TNA,” he said. The NPC Councillor said he would continue to call for international investigations on genocide committed against Eezham Tamils. “Tamil people strongly believe that they have been, and continue to be subjected to Genocide by Sri Lanka,” said the appeal sent to OHCHR in August 2014. 07.10.14 Shivajilingam reiterates majority demand of genoci..
18.08.14 Majority Tamil Councillors from North, East reques..